Have you ever wanted to build Aquaman‘s famed seahorse companion, Storm, out of LEGO? Well, now’s your chance. 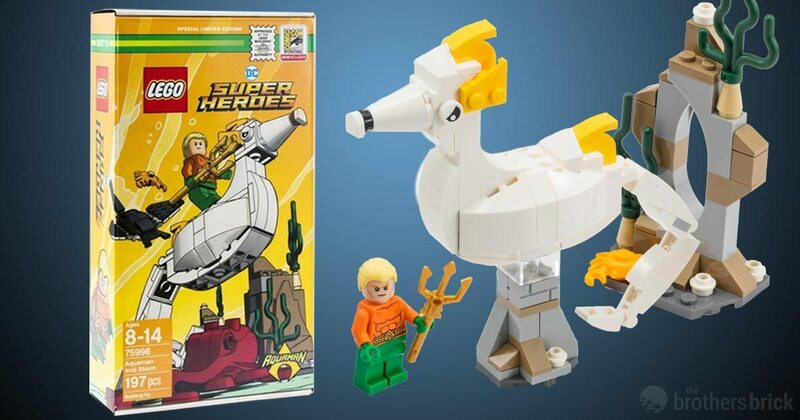 The Brothers Brick reports the latest collectible LEGO set revealed for this year’s San Diego Comic-Con International is DC Comics heroes Aquaman and Storm, which will let fans construct the original animated television appearances of the aquatic duo. The set comes packaged in a stylized box that resembles a classic comic book cover, with the Minifigure of Aquaman proudly charging, trident in hand, while riding Storm. As with other SDCC exclusives, this set will only be available for purchase at the event. Aquaman and Storm join the previously announced Star Wars Millennium Falcon Cockpit set with Han Solo and Chewbacca Minifigures. There will be a third SDCC-exclusive set revealed soon. The LEGO sets join the ever-expanding list of exclusive collectibles for this year’s SDCC, with Funko leading the pack with announcements. The vinyl toy company has revealed a series of exclusive Batman figures from artist Chris Uminga, Pop! figures based on Thor: Ragnarok, Iron Man, Guardians of the Galaxy, Deadpool and one Pop! of director Taika Waititi, among others. As with most SDCC collectibles, expect these LEGO sets to go fast if you’re at the show. The post LEGO Announces Aquaman (and His Seahorse) Set as SDCC Exclusive appeared first on CBR.